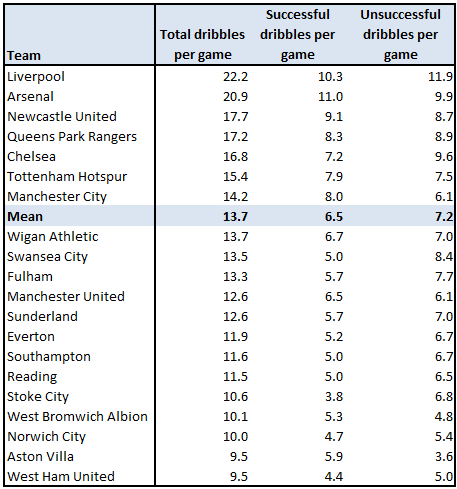 This is a follow-on from my previous post on the top dribbling teams and players this season in the Premier League. Since I took the time to prepare the data to review the best dribblers with the ball at their feet I thought why not flip the information to review the opposition as well? This is not a completely straightforward exercise because the information I have available does not identify the opposing player(s) involved when a dribble is attempted – and even if a defender does not actively tackle his opponent, his position may force the attacker into losing the ball (eg. by running out of play or into another defender). I can’t provide much insight on these ‘micro’ events on the field. But, we can do a similar team analysis as produced in the last post to consider which teams seem to invite dribbling against them, and also which teams are particularly adept at making opposition dribblers lose the ball. 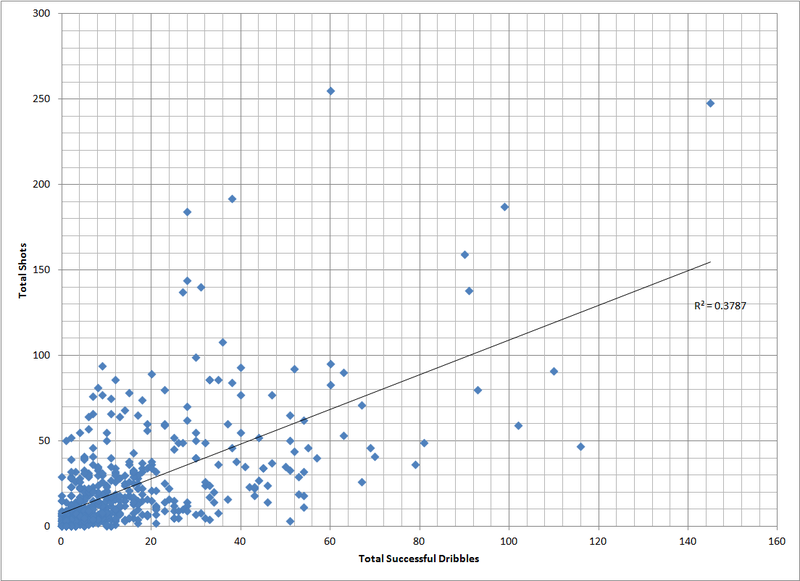 The above data is ordered by total dribbles against. We can immediately see that teams tend to dribble more often against Sunderland and Norwich (382 and 380 attempted dribbles against respectively) and least frequently against Everton (267 dribbles against). With all teams having played 23 games at the time of writing, this difference of about 5 dribbles per game against perhaps isn’t terribly telling but may give an indication of team tactics without the ball. QPR and Reading, both in the relegation zone, sit at opposite ends of this table. Alternatively, Everton and Spurs are on the low end, allowing the fewest number of dribbles against, whilst Arsenal are 4th highest despite their league positions of 5th, 4th and 6th respectively. I’m intrigued by this, and admittedly I haven’t given it a lot of thought before just typing away now, but at a guess team pressing plays a part here – Moyes’ Everton in particular have a reputation for pressing across the pitch whilst AVB’s Spurs are beginning to develop a reputation for pressing high up the field. Maybe that has a bearing? Of course, there is more to defending than pressing or allowing attackers space to dribble. Indeed, even with tight marking some players will seek to dribble to gain a yard against his opponent on the turn. 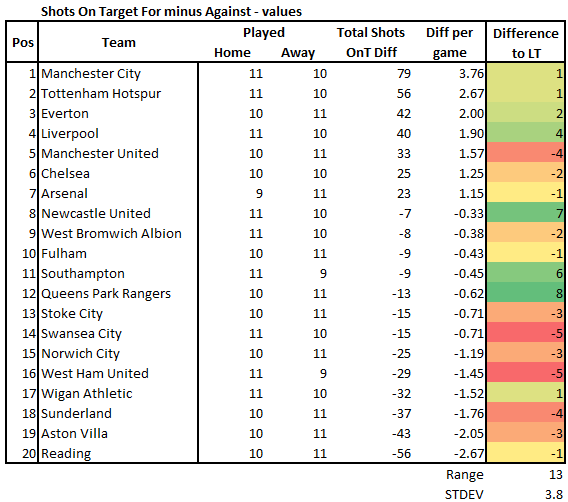 I’m not particularly fond of information for the sake of it and I’ll admit that the above graph is a bit of a jumble, but we do get a clearer picture of Arsenal and Reading in particular who allow disproportionately fewer (and more, respectively) shots against when compared to their dribbling against stats – perhaps adding some depth to our understanding of how effective their defensive style has been. What about the success rates of opponents dribbling against? The above graph tells us how successful the opposition has been at dribbling against the team in question. So, although Everton allow the fewest number of total dribbles against, they have the second highest success rate against – i.e. 53% of dribbles against them are successful. 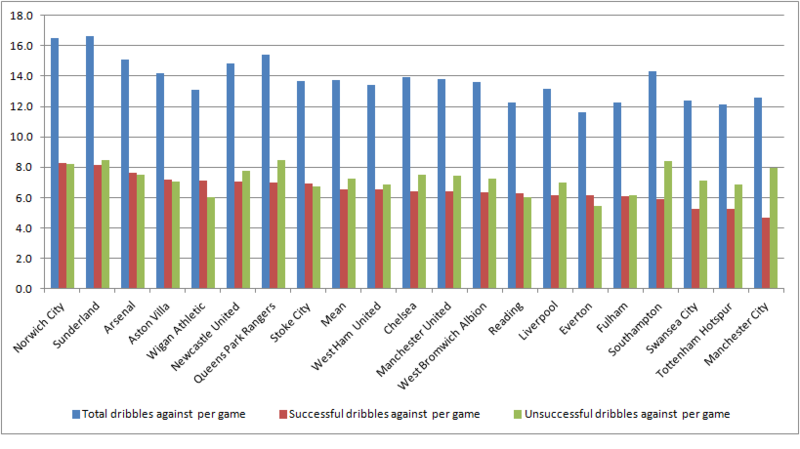 Wigan seem to put up the least fight when it comes to dribbling against with opponents having 54% success on average. But most teams are spread a few points either side of 50%, with a few outliers: Manchester City, Spurs and Southampton – all of whom are no pushovers when it comes to dribbling against. City in particular have an exceptional 37% (now I’m starting to wonder why I didn’t turn the success rate on its head for intuitive purposes!). To translate that, around 1 in 3 attempted dribbles against City are successful, which is the lowest rate in the league this year and highlights their strength across the whole pitch. This last chart is ordered by the number of successful dribbles against per game, so Everton move up a few places and Manchester City take up the position on the far right – allowing on average just under 5 successful dribbles against per game. Manchester City incidentally have conceded the fewest goals so far this year. What can we learn from this? Obviously there is more to a game of football than how often you allow the opposition to dribble successfully against you but this is still an interesting objective view of the differing defensive styles/abilities of teams in the Premier League and can no doubt be used in tandem with analysis of other defensive measures to improve our understanding of what tactics have been most effective. This entry was posted in Football Analysis, Sport and tagged Analysis, dribbling against, EPL Index, everton, Football, manchester city, Opta, performance statistics, Premier League on January 29, 2013 by thepowerofeleven. Dribbling is a much-admired skill in football. The best dribblers in the game are fixed into the history of the sport: players like Stanley Matthews, George Best and Diego Maradona are remembered for their almost superhuman ability to leave defenders trailing in their wake. Beating defenders 1-on-1 excites a crowd in a way only shots and goals can match, but in the same way that a poor effort on goal from a good position can frustrate supporters, losing the ball when dribbling in a good position can be just as frustrating! In this post I look at some of the best and worst dribblers this season in the Premier League: heroes and villains. 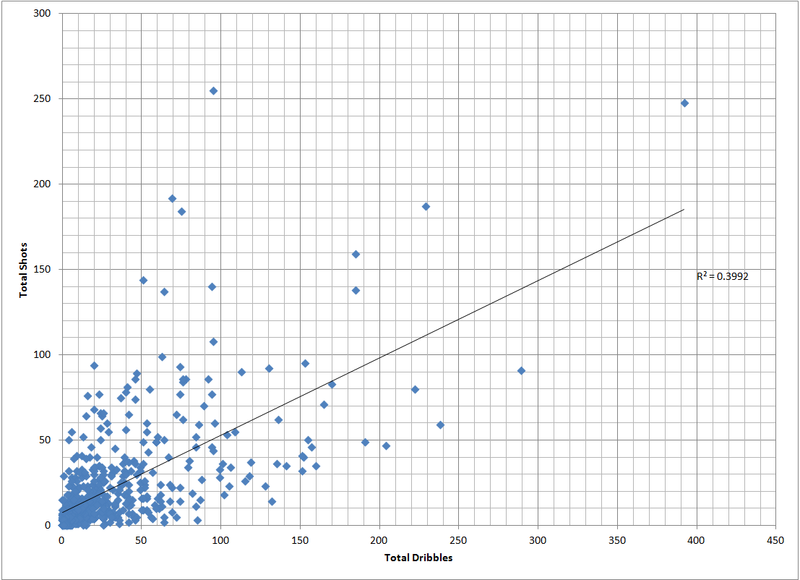 So far this season there has been little correlation between the number of times a team dribbles and whether or not a team gets results. As we can see from the above chart, the top four in terms of total dribbles attempted include Liverpool, Newcastle and QPR whilst league leaders Man Utd are mid-table in terms of dribble frequency. Liverpool fans are treated to a lot of dribbling at Anfield, but as we can see from their success rates the fans are frustrated more often than not: on average they lose the ball through dribbling about 12 times per game. Although Arsenal attempt about 1 less dribble per game than Liverpool their average success rate is better: Arsenal have the best mean dribble success per game of c.11 successful dribbles vs 10 unsuccessful. Brendan Rodgers and Arsene Wenger clearly to not mind letting their players dribble more freely than Sam Allardyce. West Ham’s dribble success rate is actually slightly better than Liverpool but they attempt less the half as many dribbles per game. Some of this is perhaps not neccessarily due to team tactics but the amount of time spent in the opposition’s half. Of course, when in the defending half, players generally know better than to take risks with the ball at their feet – so we would expect dribbling to occur mostly in attacking positions by attacking players. We must bear in mind that the dribble statistic used here gives a simple success/fail result per dribble without any additional information on the difficulty of the dribble, the position on the pitch the dribble was attempted or the actions directly after the attempted dribble. Aston Villa have the best overall success rate in dribbling (62%) but they have only attempted one more dribble than West Ham – this suggests that Villa players are very selective in choosing when to dribble or at least leave the dribbling to their most skilled players. On the other end of the scale, Stoke and Swansea have particularly bad success rates when it comes to dribbling: 36% and 37% respectively, meaning that only about 1 in 3 dribbles are successful. For the tables/data below I filtered out any players who had played fewer than 500mins and attempted fewer than 15 dribbles. From the most frequent dribblers table above we start to see the driving forces behind the team stats published earlier. Ben Arfa is arguably the dribbling king of the premier league as he attempts almost 9 dribbles per 90mins and yet still manages a positive success rate of 58% (although as a Newcastle fan perhaps I am biased!). Opposition players know Ben Arfa is likely to dribble when he is on the ball and yet they still don’t usually get the better of him. Suarez and Sterling are clearly the main contributors to Liverpool’s high frequency as they account for more than half of all Liverpool’s attempted dribbles but they both have a below average success rate. This is certainly offset by their high rates of chances created from open play. The surprise success story of the table is Samba Diakité who has a strong 66% success rate despite having a high propensity to dribble. 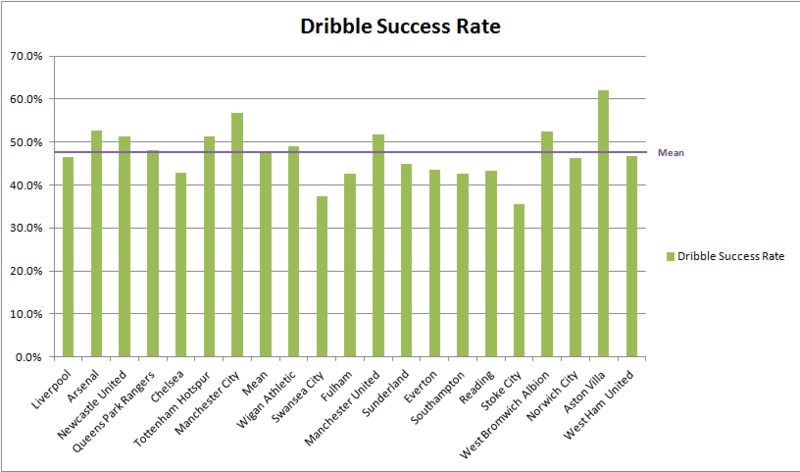 The most successful dribbler is another Newcastle player: Cheik Tioté, who has a ridiculous 84% success rate. In fact this table is an interesting mix of defensive and attacking players. Diakité again stands out, but also Dembélé and Cazorla who have both attempted more than 60 dribbles and still have an superb rate of success. 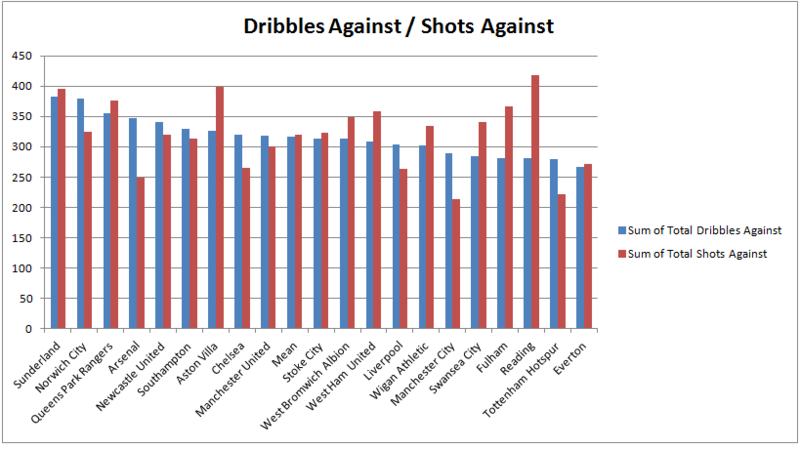 Last but not least, the above table shows the very worst dribblers this year. Stand up David Luiz. To be fair, 8 of the players in this list of 20 have attempted fewer than 20 dribbles – but David Luiz would certainly be better suited to playing it simple as he has only been successful with 2 of his 15 attempts. Kightly, Dyer and Kacaniklic are arguably even more frustrating for their managers and fans since they seem to be a little over-confident in their dribbling ability! They each succeed in around 1 in 4/1 in 5 of their attempts to beat a defender. PASS THE BALL!! This entry was posted in Football Analysis, Sport and tagged Analysis, Aston Villa, Ben Arfa, David Luiz, EPL Index, Football, Kightly, Luis Suarez, Opta, performance statistics, Premier League, QPR on January 26, 2013 by thepowerofeleven. Dribbling – heroes and villains! For this post I have looked at dribbling stats, using data from the past 609 EPL games – that is, all matches in the 2011-12 season plus everything so far this year (as at 22 Jan 2013). I filtered out players who during the period in question have attempted fewer than 30 dribbles and/or played fewer than 400mins. Doing this omits players such as Jordan Slew, who in his 1 minute on the field for Blackburn last season made 1 attempted dribble (which was unsuccessful! ), and also Petr Cech who made 1 attempted (successful) dribble in almost 5000mins. The dribbling statistic, as published here, is given simply in terms of a count of the total attempted dribbles and whether the attacker managed to successfully retain possession of the ball after beating the defender. There is no insight into the difficulty of the dribble or indeed the actions immediately after the event – whether or not for example a successful dribble resulted in a shot on goal or a chance created. These graphs don’t add a great deal of value to the analysis as they simply indicate that players who dribble more often are also more likely to shoot more often. Since the list of players, although filtered, does not account for player position it is probably just telling us that attacking players dribble more than defensive players. This is correlation – not causation. For the purpose of this post it would take more time than I can afford to delve further into the data and test the relationship between dribbling and other stats – eg. opposing team yellow cards. 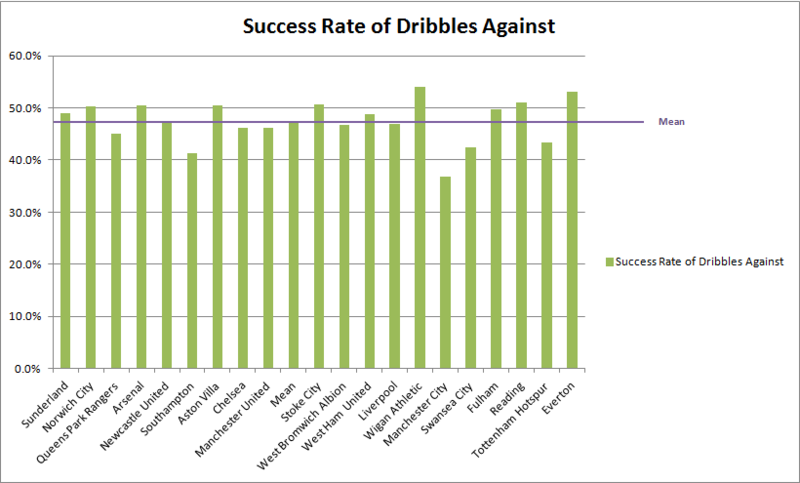 But what I can do is answer who the most frequent and most/least successful dribblers are! NB. Total Chance Created stats in the below tables only apply for this season. #1 in terms of dribble frequency is that man Luis Suarez, whose propensity to dribble beats even his appetite for shooting! He attempts almost 8 dribbles per 90mins with a rather average 37% success rate. Sammy Ameobi, who has come under some criticism this season, takes second place with just over 7 attempted dribbles per game and a similar rate of success to Suarez. N’Zonzi tops the list with an impressive 81% success rate and Arteta is second at 77% – both are quite selective regarding when they choose to dribble as they each average under 1 dribble per 90mins. In this list Diaby is the most active dribbler with an impressive 66% success rate despite a high propensity to dribble (ave 5 per game). The players above succeed in less than 1 in 3 of their attempted dribbles and would generally be best served passing to a teammate instead of trying to beat their marker. Cameron Jerome has frustrated the Stoke faithful a total of 33 times over the past 1.5 seasons: he has an optimistic rate of ~3 dribbles per 90mins despite a poor 11% success rate. Suarez loses the ball through dribbling about 5 times a game, much to the delight of opposing fans. Michael Kightly is also worth a mention as he has only suceeded in 17 of his 99 attempted dribbles, although perhaps in fairness to him many of those were for last season’s doomed Wolves side. This entry was posted in Football Analysis, Sport and tagged arteta, cameron jerome, diaby, Luis Suarez, n'zonzi, sammy ameobi on January 22, 2013 by thepowerofeleven. In this post I have published a few simple Premier League team stats with consideration to the insight they provide compared to the current league table. This can be an interesting exercise to review certain measures and analyse their efficacy in explaining team performance. These types of stats should be taken with a decent pinch of salt, because at this stage in the season (and even after 38 games) the statistics are dynamic and the sample size is small – team averages are constantly evolving and prone to ‘anomalous’ results, such as the 8-0 win by Chelsea against Aston Villa which has had a significant effect on goal difference. For the purposes of this post, I have made no attempt to smooth or adjust uncommon results. Let’s start off simply by looking at total shots. This includes shots on target, off target, speculative long range efforts, blocked shots and even scuffed shots that go out for a throw in. I have included how many home and away games each team has played because it can matter to the mean values for this sample size. For example Arsenal have played the least home games with 9; at home they average 17.3 shots per game whilst away from home they manage 13.4, a difference of about 4 shots. As we can see from the table, Liverpool are currently the undisputed shot taking champions with 1.4 shots per game more than second placed Tottenham. 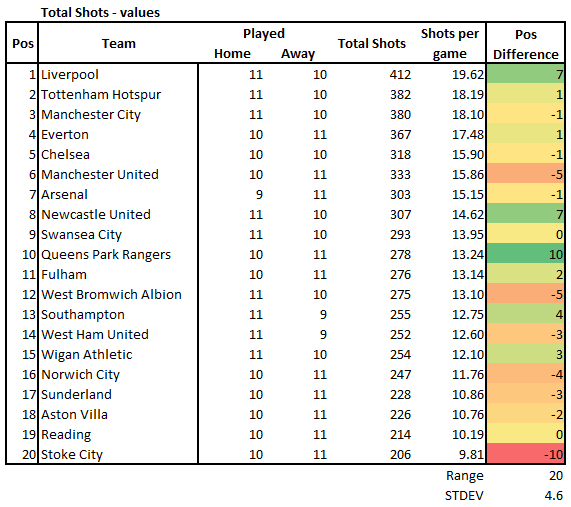 Stoke on the other hand lie bottom and take on average only 9.8 shots per game. The biggest outliers when compared to the league table are Stoke and QPR, whose positions are reversed. 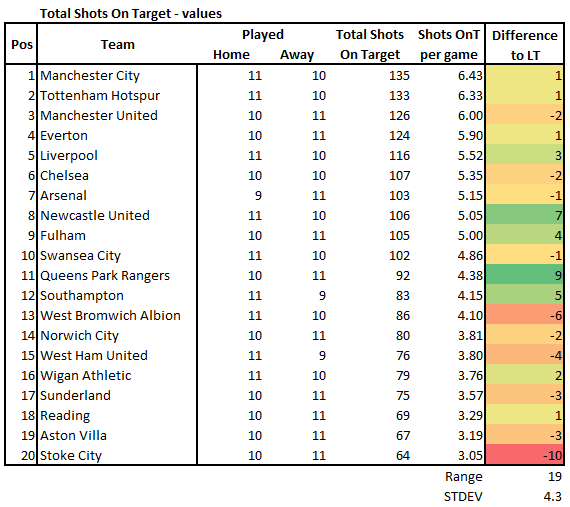 We can see quite clearly from this strange result that total shots is not a good indicator of, say, the quality of shots taken as Stoke have actually scored 4 more goals than QPR so far this season, despite having taken only 206 shots compared to QPR’s 278. For example, Manchester City and Manchester United have both had 68 big chances this season. United have scored 30, whilst City have scored 25. This shows United’s slight edge over City so far this season in terms of clinicism. When it comes to big chances conceded, the opposition have converted 10 big chances against United compared to 9 against City. So the overall goal difference just from big chances is +4 in United’s favour, a small number which nonetheless remains significant after 21 games. 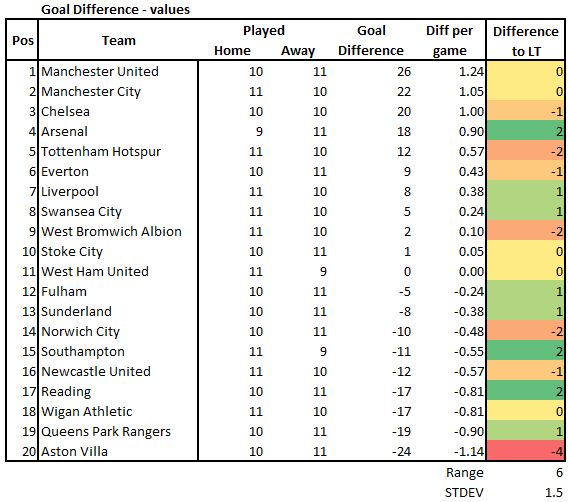 From the goal difference table we see the impact of the 8-0 loss to Aston Villa’s position. Otherwise the table broadly tells the story of the league table itself which in itself is quite unsurprising, give or take the odd shuffle here and there. This entry was posted in Football Analysis, Sport and tagged Analysis, EPL Index, Football, Man City, Man Utd, performance statistics, Premier League, QPR, Stoke on January 8, 2013 by thepowerofeleven.